Relations are 'links' between assets, they can be found for each asset in the ‘linked items’ panel. A relation knows both of the assets that it links together. This means a relation can always be discovered from both ends of its link. Relations have a type, which determines their behavior (see below). Relations also have some basic metadata that describes when and who created them. If needed, it is possible to set additional metadata on a relation to keep track of information about the link between the two assets. Relations between similar files, for example files saved as a new file or exported to another format (rendition). This type of relation is also created when an asset is dragged into the Linked items panel of another asset. Relation between a file which is placed on or included in another file. For example a PSD placed on an InDesign document or an JPG placed on an Illustrator document. This is a bi-directional relation, which means in this case that the placed PSD is “referenced by” the InDesign document and that the InDesign document “references” the placed PSD. 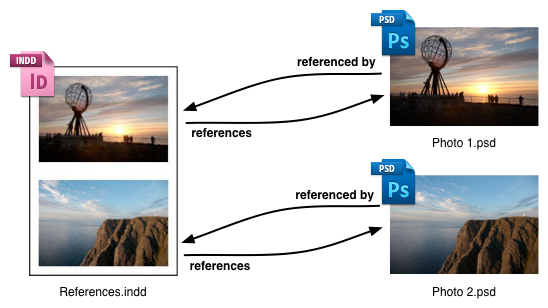 When viewed from the placed asset-side, the relation is called referenced-by. A directional relation. It is used by collections for the relations to their contents. The containing collection must be target 1/parent-side of the relation. When viewed from the child-side, the relation is called contained-by. 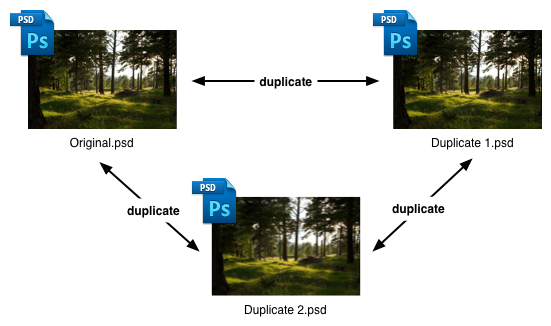 A non-directional relation used to indicate assets that are duplicates of each other. If XMP metadata is available, Elvis may create this relation automatically. A directional relation, created when a modification of an asset is checked in as a variation. When viewed from the variation-side, the relation is called variation-of. A non-directional relation. This relation type is no longer used. It is better to use the related relation type. A directional relation. This relation type is no longer used, it is better to use the references relation type. Elvis automatically creates some relations based on metadata or based on information from third-party integrated solutions (like WoodWing Enterprise). The Adobe Creative Suite (CS) products such as Photoshop, InDesign and Illustrator store information about relations between files. Elvis uses this information to automatically create relations between files with XMP metadata, specifically document IDs and instance IDs. These IDs are created and embedded on creation or saving in Adobe CS or on import into Elvis. So for the link mechanism to work properly, you have to put the files into Elvis before you use them in a layout (for example) or you must have saved them in Adobe CS before importing them. More technical explanations and samples of automatic relations are available in Automatically creating XMP relations.